Access to years of BC Hydro’s financial reports provide me with an indisputable record of the utility’s financial destruction. Eleven years ago, one citizen didn’t have detailed evidence but he did have foresight. Re: Tom Fletcher, B.C. Views, “Road show, or running out of ideas?” Prince George Free Press. B.C. bureau reporter Tom Fletcher’s article, “Road show, or running out of ideas?” would have readers believe there’s no urgent need for a fall sitting of the legislature because the Liberals have got their act so together that instead they’ll simply take it on the road. Nothing could be further from the truth. The main reason Gordon Campbell’s government isn’t holding a fall session is because it has a strategic, one could almost say, electrifying agenda of the utmost secrecy to fulfill; one involving the complete and final sell-off of the province’s primary, public electrical generating resource, B.C. Hydro, the largest and most successful operation of its kind in North America. We might recall that premier Campbell promised the Liberals wouldn’t privatize B.C. Hydro but then, via their B.C. Energy Plan of 2002, stopped the public utility from generating further power thus forcing it to buy electricity from private sources. Thanks to Campbell’s Liberal commitment to purchase additional power from these private (mostly U.S.) corporations he’s indebted the province for billions of dollars of power that otherwise could have been generated by our own public utility. Following that, his government opened up hundreds of B.C.’s rivers to private plunder while at the same time passing legislation – Bill 30 – preventing all B.C. Municipalities from enacting any zoning regulations within their jurisdictions that could alter this corporate control of our public river systems. In order to cover up all these underhanded dealings with Campbell’s corporate buddies the Liberals then out-sourced a third of B.C. Hydro’s staff to foreign U.S. corporate interests and passed legislation preventing B.C. citizens from viewing the agreements that these sell-outs signed. So now we’re paying over $400 million per year to buy our own hydro back from Campbell’s corporate friends better known as The Independent Power Producers of B.C. Their greed will ultimately drive up our cost of living and affect small businesses and the public in an untold number of ways. But there’s more. Even before Campbell’s sly sell-out we had former Socred premier Bill Bennett pulling the same shady deals with the sell off of the natural gas section of B.C. Hydro. It suddenly became private and was known as B.C. Gas and then Terasen. Corporate Gordo then passed more surreptitious legislation and bingo, Terasen Gas was no longer owned by the province but passed into the greedy hands of an ex-Enron executive from Texas by the name of Richard Kinder. …Funny how these little backroom deals just seem to grow and grow and our hydro bill mysteriously follows suit. I don’t mean to imply that the province doesn’t have other concerns requiring attention but I think this thievery of our greatest asset – B.C. Hydro – is of the utmost concern to all British Columbians. It’s time the people of this province stood up and demanded the current Liberal government sit down and provide some public accounting before they pull the plug on us and we become the Enron of the north. Does BC Hydro need all that private power to meet the demands of BC consumers? This chart reveals the quantity of electricity sold to residential, commercial and industrial users in BC during the two years under review. With demand for power flat for 12 years in British Columbia, did BC Hydro really need to pay independent power producers (IPPs) $8.9 billion in the years 2006 to 2017? Were the utility’s assets so degraded that it was compelled to use IPPs to keep our lights on? BC Hydro was spending lavishly. The utility’s assets increased by $19.6 billion or 155% in the period and its internal generating capacity rose 16% in the last decade. BC Hydro has plans to spend a further 15 to 25 billion dollars in the next decade. Additionally, purchases from IPPs have been growing, up 60% in 2017 from four years previous. Yet, there is no evidence that BC consumers need additional electricity and there is certainty that surplus electricity can only be exported for a fraction of the price BC Hydro is paying for private power. Perhaps the Black Press letter writer was a little off target but he was substantially correct. 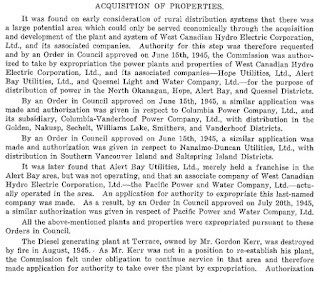 Liberal ideologues intended to privatize BC Hydro’s electricity division, as it had done with the crown corporation’s natural gas business and administrative services. However, because polls showed voter resistance to further disposition, an insidious program was developed as an alternative. The plan was not to privatize the remaining BC Hydro assets; it was to privatize the company’s profits. The public would hold all of the business risks associated with power distribution and sales while private companies would hold all of the rewards. After BC Hydro’s long history of profitable operations, Liberals knew that turning the company into a money loser would have negative political implications. However, they had a solution: cook the books. BC Hydro booked revenue it had not earned and deferred operating expenses it had incurred. It also imposed a policy of aggressive capitalization. Payments that might have been treated as repairs and maintenance, a current operating expense, were recorded as capital improvements, thereby improving net income. These moves result in BC Hydro having a Statement of Financial Position that would look far different if a less Liberal friendly auditor had been employed and if Canada’s generally accepted accounting principles (GAAP) were followed, as they would be in private business, or with an uncorrupted government. While BC Hydro has been losing money by usual standards, private power producers have been doing fine. BC Hydro pays prices to IPPs that average three times wholesale market value in western American states and Alberta. Even that statement is misleading because the average price paid IPPs is suppressed by old agreements to purchase from Kemano and other generating facilities. IPP prices are not dependent on demand but they do include annual inflation adjustments. BC Hydro’s payments will continue to rise, regardless of the markets that right wing ideologues claim to revere. Degrading BC Hydro’s financial position was not sufficient for politicians who ruled BC for 16 years. Site C was another project to satisfy the blood lust of dogmatic Liberals. They knew Site C wasn’t needed to meet foreseeable demand for power in BC. They knew that electrical consumption had been flat for years in North America and adjoining export markets were in surplus. However, Liberals friends were hungry for new business. Spending 10 or 12 billion dollars on construction of a new dam provided very large contracts to a select group. Much of the money is to be paid to companies domiciled outside BC and that provides special opportunities for people who are both greedy and unethical. Today, special interests, including Press Gallery pundits, contractors and trade unions involved in the the project, are lobbying furiously to convince the Horgan Government to stay the course and continue spending ever growing sums on a white elephant unlike any seen in British Columbia ever before. This is self-interest on parade. It will be a fatal error if the BC NDP flushes its pre-election promises for PowerBC and continues the Liberal folly that is permanently altering the Peace River valley. Or did he come into possession of some other bottom-line numbers that were more attractive? Hey Norm, here’s my rant. There’s a book called “Confessions of an Economic Hitman” by a fella named Perkins which describes to a tee on how to bring a country to its economic knees. Gordo was well coached on doing that. Gordo, Chrissy, and a bunch of former Liberal Cabinet members should be charged with breach of trust and treason (economic treason). But, before that, we have to lobby the Federal Government to bring back capital punishment for treasonous acts. I can see the above mentioned people looking for other countries to live that don’t have extradition treaties with Canada. Didn’t the Lieberals build a new penitentiary somewhere in the Okanagan? Lumby? Now is the time to use it. Gordon Campbell’s new ‘summer’ home. Summer wondering if it shouldn’t be his permanent address. There were a lot of people who “gave’ to the B.C. Lieberals and they expected a “return” on their investment. With any type of “investment” people expect a return on their money and it came from us, the consumers, voters, tax payers. worked for the B.C. Lieberals and their financial supporters. If the NDP will “can” Site C, we as a province can start paying down the debt. *I’m sure the Bildebergers are ever so proud of el gordo. he did well by them. The current government simply needs to cut up all the contracts with the IPP providers, etc. just like el gordo cut up all those contracts with the hospital cleaning staff. At least this time the cutting of the contracts will save B.C. money. given Mr. Eby’s latest findings of other things perhaps he will find something in B.C. Hydro which will result in some changes and exposure in the msm of all which went on at B.C. Hydro. For those of us who have been reading blogs these many years, we know what was going on, but the MSM refusal to report has left most citizens in the dark, where I’m sure they will stay unless perhaps Sam Cooper does another series of articles. May be we should erect statues of shame of Christy Clark, Gordon Campbell, Bill Bennett, Rich Coleman and Mary Pollack at the Site C Dam foundation. The water level should be marked in Billions of Dollars as an indication of how the Liberals sunk us deep into debt. At least, we will have the pleasure of watching the BC Liberal images sink below the surface. Unethical BC politicians rarely get taken before the Judge for their crimes against BC taxpayers, indigenous people and crimes against the environment. John Horgan and the NDP must stand behind their election promises. At least, stop the construction and let the structure remain as a Monument of Shame. Sadly, it will be our great grandchildren that will ask how we let this happen … as they drown in the debt. Future generations will hopefully learn from our past mistakes. Your in-depth, point by point deconstruction of BC political events should disarm those working for the MSM. However, the following statement might explain why it may not. The Gordon Campbell Liberals were nothing more than a corporate hit team, whose primary function was to sell off BC assets. His goal; to destroy any vestige of a dynamic province and turn it onto an economic slave for global corporations. He was removed because most of his job was done and he was becoming undetectable with his continued subterfuge. Clark was the sacrificial lamb, until the voter bought into the LNG grift. Clark made criminality publicly acceptable. Mr. Tophams letter demonstrates that many saw through Campbell’s treason, but it was not enough to deny him the Premiership. Today, BC’s economy is at the whim of Chinese land speculators and drugs. Trump is doing the smae thing in the USA, only on a much grander scale. 4 off shore companies now have the completion contract: CCCCI, FlagIron, Dragedos and EDF. 8+Billion$ financed by the same companies at 4 1.2 – 6% for the next 70 years for an interest bill of 8 – 12B$. coming out of BC residents pockets – Total for Site C / Peace River NOT NEEDED Dam – 20+ B$ – NOT going to education, health care, infrastructure. Please send to BCUC ASAP!!! I feel there is an unnecessary game of Trumpism being played regarding the Site C Dam. This game is very unfair to the current taxpayers and future generations. Your cabinet has listened to the expert advice from very qualified professionals. The majority of First Nations have expressed their beliefs that the Dam will destroy their land, ancestral burial grounds and that their Treaty Rights have been ignored and jeopardized once again. The BC Liberals received no social licence to proceed with this project and did not allow due diligence by refusing to permit a B.C. Utilities review. BC is losing millions of acres of ALR food production land due to climate change and sea level rise and Site C flooding. You “promised” that you and the NDP party would stop the Project if your party became the official government. You will have truly demonstrated that the Ministry of Agriculture really does not matter … just a band of puppets that will dance for the highest percentage of votes. The huge debt and damage to the Peace River environment is an unforgivable mistake. The Mica Dam was build to supply all of B.C. future power needs. There are benefits in investing and employing new research and technology in green energy production. The Site C Dam is an example of the B.C. Liberal failed dynasty and a pathway to financial disaster. Their plan was to build with huge debt, enrich their donors and to sell the power at a loss. This is gross negligence and a form of treason to the voter and taxpayers. The NDP was voted to become a symbol of hope and solutions … not to become part of the continued problem. Please make the B.C. dream come true. Stop the illogical Site C Dam and learn from the other Canadian Hydro-electric mistakes.